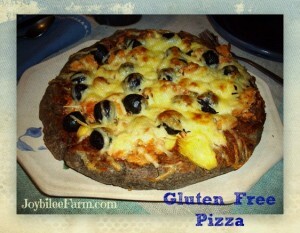 When I was forced by Celiac Disease to eat gluten-free, I missed pizza the most. Of all the foods that I couldn’t eat, pizza was the one meal that made me want to cheat. I loved the chewy, wheat crusts and the stringy, melting mozzarella cheese. In fact, almost everything about pizza sent me into cravings for the thing that would make me sick. I was addicted to pizza but I couldn’t eat it without severe pain. 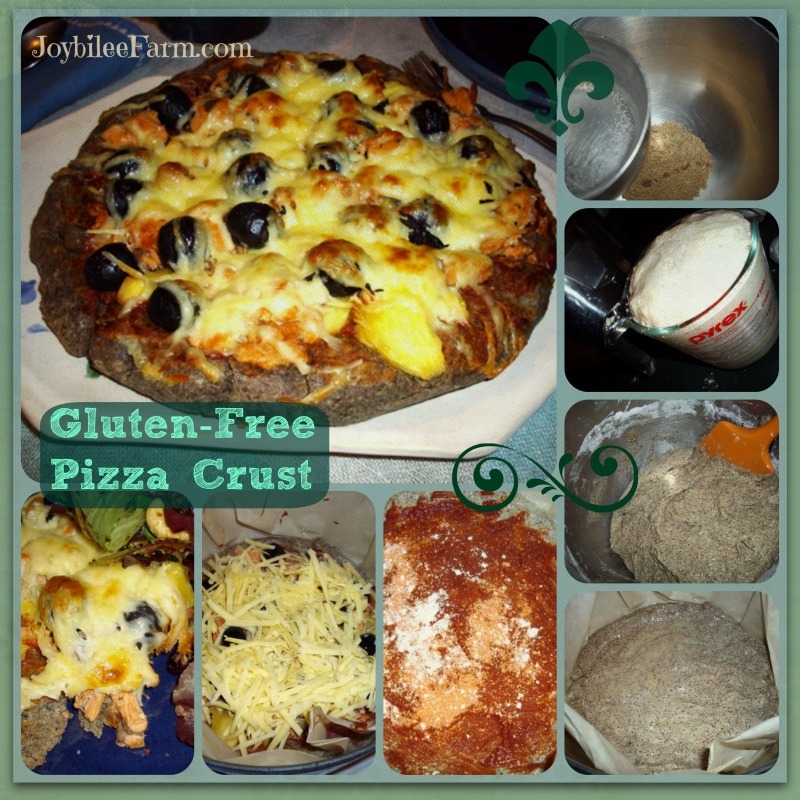 This gluten-free pizza crust solves the problem, provided that you can still eat cow’s milk cheese. If not, there are goat and sheep milk cheeses, which will melt just as nicely as mozzarella. If you are forced into the plastic textured soy cheese or nut cheeses, try pesto or an alfredo sauce instead of cheese on your pizza. It’s a less satisfying texture than real mozzarella, but it won’t make you sick, and the flavour is better than fake cheese, imho. Gluten-free dough doesn’t feel like wheaten dough. It will be wetter and it will have less structure. 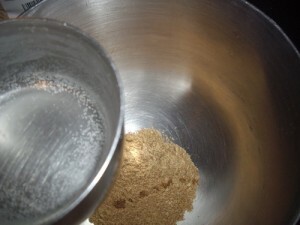 If you make it feel as dry as wheaten dough, it will be like sawdust crumbs when you are finished baking it. You don’t want that. Instead trust the process. With practice you’ll learn how the gluten-free flours behave and you’ll be less likely to stir in more flour. 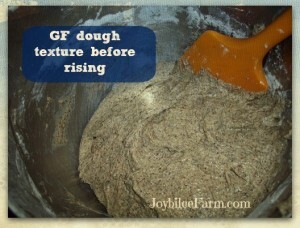 Gluten-free dough needs to be moist and it needs to stay much wetter than wheaten dough while you are working with it. To make up for the lack of structure in the dough we have to add structure. 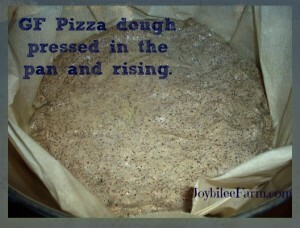 I like to use parchment paper and tall sided baking pans to give the dough structure. In this lesson I’m using parchment paper inside a cast iron pan. You can use any cast iron pan with sides that are at least two inches high to give structure to the crust. The cast iron gives an even heat to help crisp the crust during the baking. Instead of adding in more flour to make the dough easier to handle, wet your hands, rather than flouring them, as you would with wheaten dough. If you can take a glob of dough in your wet hands and form a ball that doesn’t disintegrate into a soupy mound over the side of you hand, as you are trying to form it, but would stick to you dry hands, then your dough is the perfect texture, and moistness. With a fork, whisk together the yeast, sugar, and 1 cup of hot water (110°F). 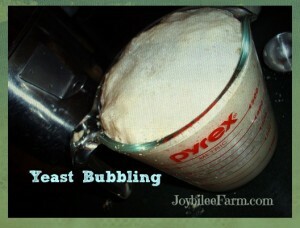 Set aside the yeasty water in a warm place until it has doubled in volume, and is frothy, about 8 to 15 minutes. In the bowl of a stand mixer, combine the brown rice flour, potato starch, tapioca starch, and buckwheat flour. Whisk them together to incorporate them together and aerate. In a small bowl, whisk the eggs and apple cider vinegar together. Pour this into the mixing bowl, along with the flax slurry and yeast mixture, and the flour mixture. Mix well. Warm the remaining 1 cup of water up to 105° and add slowly, until the dough looks like it does in the photograph. If it’s a very humid day, you may need to a little less of the water. If it’s dry you’ll need the whole cup. Experience will teach you how much water to add, so don’t be afraid to experiment. It takes 10,000 hours to master a new skill, so plan to invest a little time to get the feel of working with gluten-free dough. The dough will be wet and tacky. Don’t worry. That’s the texture you want. You will be tempted to add more flour, since you are thinking of gluten bread. Do not add additional flour. Instead, scrape the dough into a large, oiled bowl. Cover with plastic wrap and let it rise for 2 hours. Over those 2 hours, the dough will become more elastic and a little drier. The dough will still be sticky to the touch. But you should be able to hold a mound of it in your hand and it will keep its shape, without overflowing your hand. If it overflows like a puddle from your hand, stir in an additional ½ cup of rice flour. Note that the amount of flour you need depends on the amount of humidity in your house on baking day. On a drier day, you may need less flour than on a day when it’s raining or foggy. If you want to avoid bread dough sticking to your hands, wet them with just a bit of water. Grease a cast iron skillet well. Grease 1 piece of parchment paper about the size of the bottom of the skillet and up the sides of the skillet. Press the dough onto the prepared parchment paper, into the bottom of the skillet, with wet hands, until it is about ¼ inch thick, and even. Form an edge on the crust, along the circumference of the pizza crust. The skillet will support the sides of the dough as it rises. Allow the dough to rise for 30 min. while you prepare the pizza toppings. Spread 1 tsp. of olive oil on top of the dough using a pastry brush. Spread a thin layer of tomato paste over the olive oil. Sprinkle this with oregano, basil, and pepper. Drained canned pineapple or fresh pineapple cut into bite size pieces. 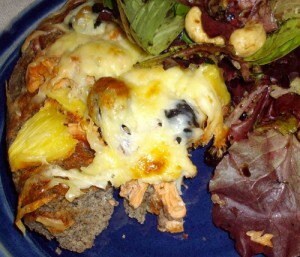 Top everything with 1 to 2 cups of grated mozzarella, Monterey jack, Edam, or gouda cheese. The cheese will melt as the pizza cooks. Preheat oven to 400F. Place the frying pan into the oven. Bake for 15 minutes at 400F and then reduce heat to 350F and bake for an additional 10 to 15 min, until crust is golden brown and the bottom of the crust is crisp and golden. You can check this by removing the pan from the oven and lifting the parchment paper from the bottom crust. If it is still pale on the bottom, return the pan to the oven for an additional 5 minutes. At this point, you can lift the pizza out of the pan, using the corners of the parchment paper and supporting the bottom of the pizza. You can lay the pizza on a pizza stone or pizza pan with holes to finish crisping the bottom crust, if desired. Remove pizza from the oven and allow to cool for 10 minutes to allow the cheese to solidify before cutting into slices. In the next lesson, I’ll go over a way to make gluten-free dinner rolls using this same dough. 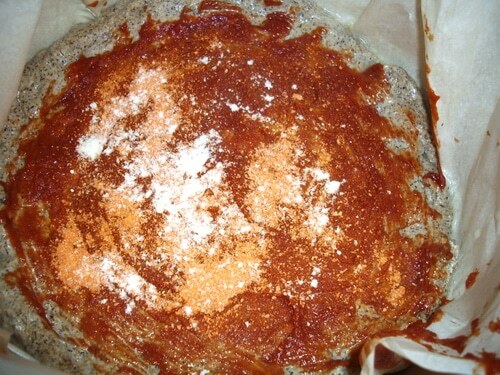 Gluten-Free Pizza dough for hassle free pizza. Grind whole flaxseed in a coffee grinder or blender. Place flax seed in a heat proof bowl or measuring cup. Pour in the boiling-hot water. Whisk, quickly, until the seeds have formed a thick, viscous slurry. Add the 2 tsp. of sea salt. In a small bowl, whisk the eggs and apple cider vinegar together. Pour this into the mixing bowl, along with the flax slurry and yeast mixture, and the flour mixture. Warm the remaining 1 cup of water up to 105° and add slowly, until the dough looks like it does in the photograph. Do not add additional flour. Scrape the dough into a large, oiled bowl. Cover with plastic wrap and let it rise for 2 hours. Over those 2 hours, the dough will become more elastic and a little drier. The dough will still be sticky to the touch. But you should be able to hold a mound of it in your hand and it will keep its shape, without overflowing your hand. If it overflows like a puddle from your hand, stir in an additional ½ cup of rice flour. If you want to avoid bread dough sticking to your hands, wet them with just a bit of water. Grease a cast iron skillet well. Grease 1 piece of parchment paper about the size of the bottom of the skillet and up the sides of the skillet. Press the dough onto the prepared parchment paper, into the bottom of the skillet, with wet hands, until it is about ¼ inch thick, and even. Form an edge on the crust, along the circumference of the pizza crust. The skillet will support the sides of the dough as it rises. Allow the dough to rise for 30 min. while you prepare the pizza toppings. Spread 1 tsp. of olive oil on top of the dough using a pastry brush. Spread a thin layer of tomato paste over the olive oil. Sprinkle this with oregano, basil, and pepper. Preheat oven to 400F. Place the frying pan into the oven. Bake for 15 minutes at 400F and then reduce heat to 350F and bake for an additional 10 to 15 min, until crust is golden brown and the bottom of the crust is crisp and golden. At this point, you can lift the pizza out of the pan, using the corners of the parchment paper and supporting the bottom of the pizza. You can lay the pizza on a pizza stone or pizza pan with holes to finish crisping the bottom crust, if desired.